900m above sea level, in the foothills of the Karwendel mountain, violin makers have been hanging their instruments in windows and on balconies to dry for the past 150 years. 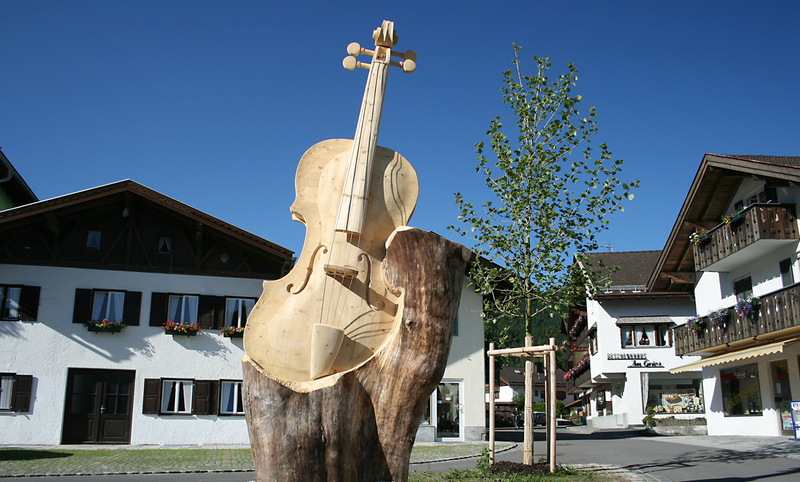 The apprenticeship is not only sought after because Wolfgang Amadeus Mozart played a Mittenwald Violin. Nowadays, it is more and more the case that hikers and bikers are the ones who make the noise in the highest climatic spa in the Bavarian Alps. Mittenwald is situated in Germany’s most loved hiking region and – according to Bike Magazine – in one of the best biking regions of the Alps. Round about 100 km south of Munich it is the hikers, bikers and families who call the tune, from piano to fortissimo. The ice age glaciers of the Inn valley have left behind small mountain lakes like precious stones. It is almost kitschy how the apophyses of the Zugspitz massif mirror themselves in the Ferchensee. Another souvenir of the ice age are the typical mogul meadows, one of the top 100 biotope’s of Bavaria which crocus-, catchfly-, gentian oceans glow. Lovers of nature can get a free massage in the tingly “barefoot hiking track” on the Kranzberg which one can reach conveniently with the chair lift. A little bit more south close to the border to Tyrol on a steel footbridge above the brawly Leutascher Ache children intently listen to the myth of the ghost of the gorge. One can get really high up with the Karwendelbahn – in the height of 2,244m even grown-ups will get goose bumps when they visit Germany’s highest placed nature information centre. Looking like a tremendous telescope the construction surpasses the precipice by 7m; the view into the Isar valley 1300m below creates a tremolo in the stomach. It is a good idea to take a walk from here to the impressive panorama of the Alps, adept mountaineers will start their climb in the Mittenwalder Klettersteig which is the fortissimo of cultivated hiking trails just after sunrise. Down in the valley the 300 km long Isar shows herself from her wildest and most natural side in the Alpenwelt Karwendel. In top condition the bike trail along the turquoise blue andantes gurgling Isar winds itself from Mittenwald through Munich right until she discharges herself into the Danube. It opens a rich source of fossils and plutonic rock, many of the treasures can be viewed on the geological nature trail Lautersee. Passionate mountain bikers know Mittenwald as the starting point of the Transalp to the Garda Lake and they find that their favourite tours with altitude profile which can be downloaded with GPS are quite forte.